Dedicated on October 2, 2006, this garden provides a place where cancer patients and their families may express their hopes, dreams, fears and faith through the color and artistry of beautiful flowers, trees and plants. In addition to offering patients and families the opportunity to design, plant, and maintain colorful gardens, the Garden of Hope also provides an important therapeutic benefit for people going through difficult times. This secluded area, surrounded by trees and shrubs, affords a place for quiet contemplation and observation of nature for all Garden visitors. Benches provide places to view a gentle stream which flows through the garden and seasonal plantings enhance the experience. To see Garden of Hope in action, click here! 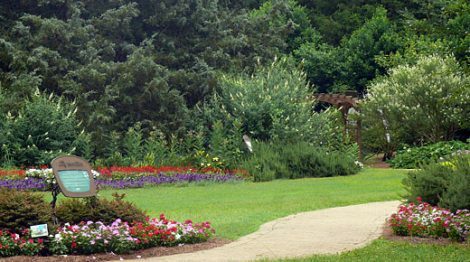 Founded by Intergraph Corporation in 2006, the Garden of Hope is a special place in the Garden that honors cancer patients and their support network through horticulture therapy and a chance for patients to tell their story. Intergraph honored three people with the Spring planting. For the fall 2014 planting, Clearview Cancer Institute staff worked with Garden staff to design the areas. The Garden is proud to partner with Clearview Cancer Institute in honoring and recognizing their patients!